YOUR SHOPPERS. WE’RE EXPERTS IN MOVING THEM. While magazines may be seeing market maturity, there are many titles that are seeing great success. New magazines continue to be published. Sales in the billions prove that quality publications are exciting to readers. With magazines, retailers gain impulse sales that build larger profitable baskets. Content is king and when a magazine appeals to a shopper, she will seek it out. Her passion comes in a curated package that she trusts. Failure to find it in your store will have her looking elsewhere. 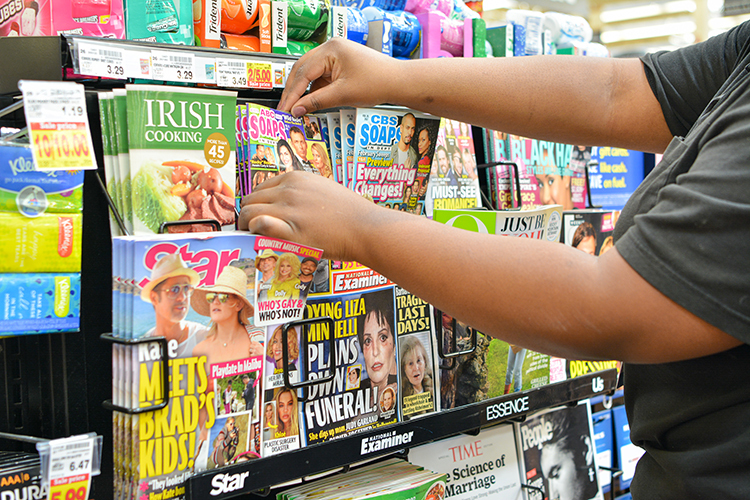 Magazines can answer a retailer’s movement toward hyper-customization within their stores. The variety that magazines offer can help retail focus on differentiating and building shopper loyalty. Check out the Magazines At Retail site for more information about how magazines are working at retail. Are you an independent retailer? With over 4,500 magazine titles available, the Independent Retailer Catalog helps you find just the right title mix for your store. Browse by title category or find a specific title in the index. Click here to go to the catalog. Magazines are similar to milk, they’re perishable! We get them to stores quickly so they’re there when your shopper is walking by. Magazine distribution is complex, we continue to look for ways to simplify it ~ Tapping into data to decide where those magazines are best placed for optimal sales is just one thing we do. Retail Display Allowance payments are simpler today + Scanned-based trading ensures retailers don’t have those inventory carrying costs. We’re experts in all aspects of magazine movement from delivery logistics to sales—and we know a vital part of your sales includes merchandising. Our merchandisers stock and restock products on a weekly basis, in many cases. Magazines are a profitable product for retailer checkouts but don’t take our word for it, we work with your data to optimize your checkouts. Full transparency into what’s working, what will give you the biggest bang for your buck. Magazine buyers rank among retail’s best customers. That translates to bigger baskets and more impulse sales. “Influentials” influence 91% of the population. They’re avid readers. What are the incremental sale benefits? Recipes require ingredients, they buy those at retail. Cosmetics are advertised, they buy those at retail. Trends are set, they buy on-trend items at retail. How do I get my publication into stores? If you’re a U.S.-based publisher, you can partner with us by completing our magazine vendor agreement. Click here for more information. If you’re a Canada-based publisher, you must work with a national distributor to arrange placement. For more information about this opportunity, please click here.